Apps aren't everything. Despite the plethora of to-do apps and note-taking apps available, pen and paper can still be a valuable productivity tool. In fact, paper note-taking and task management systems have been experiencing a revival in recent years, as we grapple with technology taking over our lives and try to avoid the distractions the internet offers. You don't necessarily have to choose one approach or the other. Both apps and paper notebooks have particular advantages, and it's possible to combine them into one awesome, productivity-producing system of your own. Perhaps the greatest downside to paper is that it's free-form by default. It's what makes paper great to write and sketch ideas in any way you want, but it also makes it difficult to keep those ideas organized. That's where paper productivity systems come in. While you don't need a system to use a pen-and-paper to do list, it can be a handy way to add a little structure to the open flexibility of a notebook. These systems are designed to give you just enough structure to help you get things done, while still enjoying the variety of pen-and-paper methods for staying organized. The Bullet Journal is centered around the idea of rapid logging. The Bullet Journal system has been around for a few years now, and is experiencing a surge of popularity at the moment with thousands of people participating in the "BuJo" community. Developed by digital product designer Ryder Carroll, the Bullet Journal system is built on the idea of rapid logging: using different bullets to denote types of information (notes, tasks, events, etc. ), then writing down the info quickly with little detail. This approach helps you keep from wasting time while still getting an organized journal or to-do list without much effort. The core of a Bullet Journal is a rapid logging page (or section of a page) for each day. That contains the day's tasks and events, as well as any notes or ideas that come up throughout the day. Beyond the daily pages, the Bullet Journal method has a few other sections to help you stay organized. For each month, there's a double-page spread for noting important events, and a list of monthly tasks. There's also a double-page spread for the next six months, known as a "future log," where you can write deadlines or events well into the future. There are also collections, or themed lists such as books you want to read or items you need to purchase. The Bullet Journal system comes together with the index, usually kept in the front of your notebook. Most pages aside from your daily log are given a reference in the index, noting their topic and page number. This makes everything easy to find later, and lets you use the next blank page in your notebook for anything from a future log to a new collection, rather than planning out sections for different types of pages in advance. The Bullet Journal system is perfect if you like to have a single notebook for everything from meeting notes to your to do list, and you like being able to use the next blank page for whatever you like. And with collections, you can even keep your store list in the same notebook. If you like the idea of a sectioned-out notebook that still has some of the flexibility of the Bullet Journal, Strikethru might be a better system for you. The Strikethru system doesn't use an index—something its creator, Chris Kyle, found too cumbersome to manage. Instead, it divides your notebook into various sections: one for your daily task lists, one for your themed lists (similar to the Bullet Journal's collections, except these are all actionable tasks), and one for brain dumps and taking notes. Strikethru has a more specific setup for daily pages than the Bullet Journal, allocating a full page per day, and advocating you list a maximum of nine tasks. One unique feature of the Strikethru system is the vault—the section of your notebook housing themed lists of tasks, like gift ideas or project-related tasks. Each page in the vault also houses nine tasks, numbered 1-9. Since the system is based on the idea of only ever working from your daily task list (called the "live list"), you can migrate tasks to your daily list without rewriting them. Simply use the page number and the task number to reference any task in your vault. For instance, 12.5 would be the fifth task on the 12th page. Strikethru is a great system if you like to keep your various task lists separated, and want a dedicated space in your notebook for daily to-do lists and note-taking. If those two systems seem a bit complicated for you, Autofocus might be a better option. Autofocus is based around one list of tasks, so there's no setting up sections of your notebook or updating index pages. You can even use a plain pad of paper rather than a notebook, if you prefer. The Autofocus method works like this: You write a list of everything you need to do. Then, when you're ready to work, you read over the list once, just reading it at first without planning to work on anything. And then you read it a second time, this time looking for tasks that jump out at you. This is why it's called Autofocus: It's designed to provide balance between your rational mind, which knows what you should work on, and your emotions, which tell you what you want to work on. Reading over your list of tasks, you'll find one or more jump out at you, nagging at you to work on them. Some will be things you're excited to work on, others will jump out because your rational mind knows they're important. What you're looking for is balance. The task that draws you to it because you want to work on it and because it's important. Of course, sometimes you'll have to do important things that aren't fun, but what you want to aim for is a balance of both. Once you decide to work on a task, the Autofocus system only requires you do some work on it. You don't have to finish the task. When you don't want to work on it anymore, you cross it off the list and rewrite it at the bottom. Eventually you'll work on a task enough times that it'll be finished and you won't need to rewrite it. This system is great if you don't need to categorize your tasks, and want a way to make sure you're always moving tasks forward, even if they're too big (or too boring) to finish in one go. Each of these systems offer something to help keep you productive, but it's easy to imagine an app offering the same benefits with less work. Why should you choose an analog productivity system, instead of just searching the App Store for another app? One of the greatest benefits to using pen and paper over digital tools is that you can use them however you want. Most software is designed with the ideas and opinions of its makers in mind, so you can't bend it to your will completely (unless you make your own digital tools, of course). With a notebook and pen, on the other hand, you can use any of the analog systems mentioned above, switch from one to another, or take pieces of each and cobble them all together into your own system. And with analog methods, you can keep using the same tools in different ways. That's perhaps the most important benefit if you're tired of spending too much on new tools in the hope of finding a miracle tool. If you try the Bullet Journal method and decide it's not for you, you can try something else on the very next page of your notebook. No new supplies (or expenses) needed. And no waiting for apps to provide updates or bug fixes. Speaking of supplies, one of my favorite things about analog systems is they let you use whatever tools you prefer. Whether you like high-end fountain pens and leather notebooks or ordinary pencils and legal pads, you can use the tools you feel most comfortable with—and can afford—and still benefit from these systems of organization. And, typically, you have the tools you need already on your desk. Some people simply prefer a tactile experience. I'm one of them. I love the feeling of putting pen to paper. But beyond enjoyment, there's a very good reason to handwrite your notes and to do lists. Studies have shown we tend to remember things better when we handwrite them. When taking notes on a keyboard, we tend to transcribe things directly (even when we're told not to—it's just too easy to do). On paper, however, we're usually slower at taking notes, which forces us to paraphrase, doodle, and shorten our notes. We spend more time thinking about what we're writing when we write notes by hand, because we have to understand and interpret the information so we can write down the most important parts quickly. All that said, paper isn't perfect. It's still an analog tool, without any of the digital niceties we've become accustomed to with apps. That's one of the many things that can push you to go paperless, in pursuit of these features only digital tools can offer. No piece of paper is going to ring a bell to remind you to pay a bill or send an invoice. Paper relies on you putting in the time and effort to stay on top of due dates yourself. If you've been checking your paper diary or calendar every morning for the past 20 years, you can probably rely on writing down important reminders, but if you're not 100% sure you'll check what you wrote, you could miss an important deadline by relying on paper. Digital tools, on the other hand, push notifications to your phone, computer, or even your watch, that are hard to ignore. Digital tools offer search features that simply can't be paralleled on paper. From searching through years worth of information to searching through task names and notes attached to calendar events, this is a built-in feature a paper notebook can't beat, even with an index or sticky tabs to mark oft-used pages. If you've ever worried about the safety of important paper forms, documents, or mementos, you know how tricky it can be to guarantee these don't get lost. Although you can often scan and digitize paper, it's a lot of effort to maintain a digital copy of everything. With software, however, backups are usually done for you automatically, and if not, are easy to set up. And it's much easier to physically spread out your various backup copies when they're digital, to make them even safer. Related: How to back up all your apps and devices. With most digital tools offering syncing to the web, mobile apps, and desktop apps, it's a lot easier to always have your tools with you. Most of us are used to carrying our phones around, so if our to do lists and calendars are synced to those devices, there's no extra effort to make sure we always have the information we need. Clearly, both digital and analog approaches have upsides—and you don't have to choose one or the other. Instead, you can use the best of both approaches to stay more productive on paper and still find the things you need and stay organized. Here's how to manage your planning and organizing to take advantage of analog and digital tools together. There are few things better for focus when it comes to a daily task list than a sheet of paper. There's something very immediate about writing your to-do list on paper, and you can keep it visible on your desk all the time, even when your computer screen is full of other things. You can also employ handy tricks with a paper to-do list, like using sticky notes to put tasks front and center so they're not forgotten, or using this trick for focusing on one task at a time. With the 1 Post-It Rule, for example, you put all of your daily tasks on the sticky note and only get one sticky note per day—forcing you to prioritize. Since notes are taken better and better remembered when they're done by hand, take a notebook and pen to meetings, classes, or conferences. This will force you to focus on the most important points being made and ensure you understand everything well, so you can paraphrase it in your notes. If you want to make note-taking more fun, you can also try sketchnoting—using diagrams, doodles, and variety in your writing to make your notes fun to take. Plus, drawing things helps us remember them better, so this approach will boost your memory even more. If you've ever tried to go all-in with pen and paper, you know it can be tricky to plan anything far in the future. Your analog calendar only goes so far, and your Bullet Journal requires you to write out future months, which can get messy and time-consuming if you go far beyond a year. Digital tools, however, can handle almost any date you want to throw at them. Your calendar or your task manager can likely take a date two, five, or even ten years into the future. And you won't have to worry about migrating the event or task to future notebooks or calendars. Just type it in once and relax. Tip: Looking for a new calendar app? Here are the best calendar apps to try. For anything that requires a reminder so it gets done on time, digital is the way to go. It's more reliable, and it comes to you. You don't have to rely on your memory to get things done or show up to events. This is also the best approach for any important recurring events. Rather than remembering to rewrite these tasks or events every week or month, you can enter them once into a task manager or calendar, set them to repeat, and enjoy the ease of regular reminders. If you love the flexibility and freedom of paper but you just can’t give up the benefits of digital tools, a hybrid option might be best for you. Livescribe has worked for years to bring analog and digital note-taking together. The Livescribe smartpens let you write on paper and automatically make digital versions of your notes. You can even record audio with them. Using specialized paper (which can be purchased or printed for free at home) covered in tiny dots, the pen knows where it is on the page, and can recreate your notes and sketches inside the app. The smartpens cost between $99 and $190, while a 4-pack of single subject notebooks will run you $25. 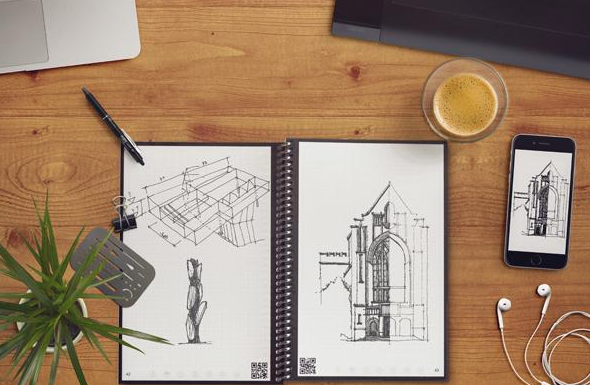 Moleskine's Paper Tablet is similar: a notebook designed to look like a tablet that lets you write or draw on paper with a special pen that can tell where it is on the page and log your sketches. A companion app then captures your scribbles in real-time. For occasionally digitizing notes, it’s worth a look. Pricing for a Smart Writing Set, which includes the pen and a notebook, is currently $199. Or, you could skip the paper and treat digital apps like a paper notebook. Many Windows tablets and notebooks—including those from the Microsoft Surface line—come with a stylus so you can write or draw on the screen. Similarly, the Samsung Galaxy Note and other large Android phones and tablets let you quickly take notes with a pen. And with the iPad Pro and Apple Pencil, even Apple’s getting in on this game—and you can get similar effects with 3rd party stylii for older iPads and even your iPhone. Together, these tools provide an experience closer to analog than any previous devices. For both Windows pen-enabled laptops and the iPad Pro, note-taking apps like OneNote, and Evernote let you write or draw new notes, so you can get the feeling of analog note-taking without having to use a separate app for your typed or scanned documents. For that authentic analog feel, you just can’t beat paper. That's where a modern take on the old-school notebook comes in. Combining a specially-made paper notebook and a matching mobile app can make it a breeze to scan and upload your notes. Moleskine’s Evernote notebook, for instance, gives you the familiar feel of a classic Moleskine, with an easy way to save your analog notes to your Evernote account. The notebook’s lines are made from tiny dots, to help your phone’s camera line up the page, and included stickers are recognized by the accompanying app to automatically tag your scanned documents. Expect to pay between 15 and $25 per notebook. Leuchtturm1917, another notebook company, teamed up with Whitelines to create a similar offering to the Evernote Moleskine. These notebooks look a little unusual because they have, unsurprisingly, white lines instead of grey or black. These lines, as well as markings in the corners of the pages, help the Whitelines app line up your pages when scanning. You can save the completed scan as an image to your phone, or share it to your Dropbox or Evernote account. The Whitelines Leuchtturm notebook runs about $22, but Whitelines has its own set of notebooks that are between $8 and $15. For a completely different approach, Mod Notebooks come with a built-in digitization service. After filling up your notebook, simply mail it back to Mod with its included free shipping, and their team will digitize its contents for you within 5 days. Once they’re done, you can use the Mod mobile app to access a digital version of your analog scribbles. You can also sync your notes with Dropbox, Evernote, and OneNote. Prices for the notebooks are around $25 each. And, last but not least, there's the Rocketbook Everlast, an infinitely reusable notebook that you can erase via microwave or a drop of water and also quickly send your notes to apps such as Evernote, OneNote, Slack, and Dropbox. Prices range from $12 to $25 per notebook, but since you can keep reusing it, it's a lower investment than other notebooks. The great thing about taking what you want from these tools and systems is you can come up with something that works perfectly for your unique situation. Let yourself experiment and find the ways both digital tools and paper-based systems suit your needs. This post was originally published in August 2016 and updated in March 2019 to include additional details and products. *Title image by Alejandro Escamilla via Unsplash. Bullet Journal photo by Ryder Carroll/The Bullet Journal. Strikethru photo by Striketh.ru. Autofocus photo by Exist. Livescribe photo via eruantalisse.nl. Moleskine Paper Tablet photo by psfk. iPad Pro photo by Digital Trends. Moleskine Evernote notebook photo by Evernote. Leuchtturm notebook photo by bureaudirect. Mod notebooks by The Coolector. Sketchnotes photo by Mike Rohde.